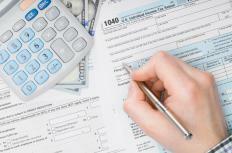 Tax laws limit how much investment income can be sheltered for a minor. In an effort to make certain that taxpayers do not shelter investment income from tax by placing investments under the name of a minor child, tax laws in the United States were changed, creating special treatment for a minor’s investment income. If the income exceeds a certain limit, then a portion of it is taxed at the parent’s higher tax rate. This investment tax has become known as the kiddie tax. The first step in determining if a child meets the qualifications for the kiddie tax is to calculate his or her investment income. In this situation, all interest, dividends, capital gains, rents and royalties qualify as investment income. If the child receives taxable social security, annuities or pensions as a beneficiary of a trust, that income will also be included. If the total of these exceeds a prescribed amount, then he or she meets the first requirement for kiddie tax liability. The next step is to see if the child meets the age and support qualifications. Originally, the kiddie tax only applied to children under the age of 18, but was later expanded to include 18-year-old children who do not provide over one-half of their support, as well as children between the ages of 19 and 24 who are full-time students and do not provide over one-half of their support. If a child does provide the majority of his own support, or if he is married and filing a joint return with a spouse, then he is excluded from kiddie tax rules. This tax only applies to children with at least one living parent; orphans are not subject to the kiddie tax. To determine who has been the primary provider for a child, it is necessary to ascertain the full cost of his support for that calendar year. Support includes all money spent on lodging, food, clothing, recreation, transportation and education. If a child lives at home, then his lodging costs are a percentage of the rental value of the home and utilities. For example, if a family of four live in a home that would rent for $1000 US Dollars (USD) per month, then the child's portion of the lodging cost would be $250 USD per month, plus one-fourth of the utility bills. Any scholarships received by a full-time student are not considered support for either party, nor are any of the child’s earnings which he has placed in a savings account. If the child is deemed to be liable for the kiddie tax, then he or she must file the Internal Revenue Service (IRS) form 8615. Various worksheets are provided to determine the child’s taxable income, as well as the tax bracket of his parent. A child is allowed to be taxed on a small portion of his investment income at his tax level, while the rest is to be taxed at the parent’s level, providing the parent is in a higher tax bracket. If the child is in the higher bracket, then all of his income will be taxed at that higher rate. If the child’s parents are married and filing a joint return, their joint income is used on this form. If the parents are married but filing separately, then the parent with the highest income is used. In the case of a single or divorced parent, the custodial parent’s income is required for the form. Things become even more complicated if the custodial parent has been remarried. If he files jointly with his new spouse, the joint income is claimed, and if he files separately, then the income of the highest spouse is used, even if that person is not the biological parent of the child. What Is a Dividend Reinvestment Tax? Which Countries Use Progressive Taxes?